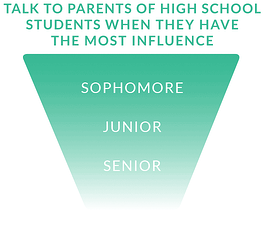 Parents are typically most influential at the start, when families are deciding which schools might be right for the student. Once the consideration set of schools is established, however, students tend to have more influence in terms of choosing their top schools and then making the final choice. If you’re one of the first colleges to contact a parent — before their mailbox and inbox are overflowing — you’ll have a better chance of breaking through the clutter. Parents are often most excited about the process at the beginning, when anything is possible for their child — and before they’re dealing with hassles like financial aid forms and application deadlines. Even though parents have less influence as the process goes on, they become more involved. This makes sense when you realize that students often need their parents’ help to manage the logistics of visiting campuses, applying for financial aid, and all of the other steps involved. For example, while 80% of parents of sophomores have acted to support their student’s enrollment (which is still a high number), 98% of parents of seniors have done so. Focus less on “selling” your institution to parents at the end of the process, when they’re often just trying to look up deadlines, find forms and gather additional information forms or other [post-decision] information. Instead, make it easy for parents to complete these tasks. For example, Xavier University asked parents of admitted students if their child was likely to deposit; if a parent said “maybe,” Xavier asked them what additional information they needed to support their child.